You may start your trip or life in Korea soon. If it is the case, read the following posts to have an idea about what is expecting you here. Traveling to foreign countries you can see a lot of new interesting things, check in in many awesome locations, meet new great people, enjoy new kind of food and gain a lot of new experiences. That‘s why I really love traveling. But before you get to the destination of your trip, you need to organise many other things, too, e.g. apply for a visa, think about how to get cash, purchasing a sim card, take a cab, etc. In this post, I’m gonna share with you some good things to know upon your arrival, that might be helpful for you first visit to South-Korea. You may need a visa, maybe not to enter South-Korea depending on your nationality, purpose and length of stay. The best information about that is available on the official page of Visa Korea Portal . Please check it before you plan to come. So, now everything is booked and you’re on the airplane ✈️ to Korea. 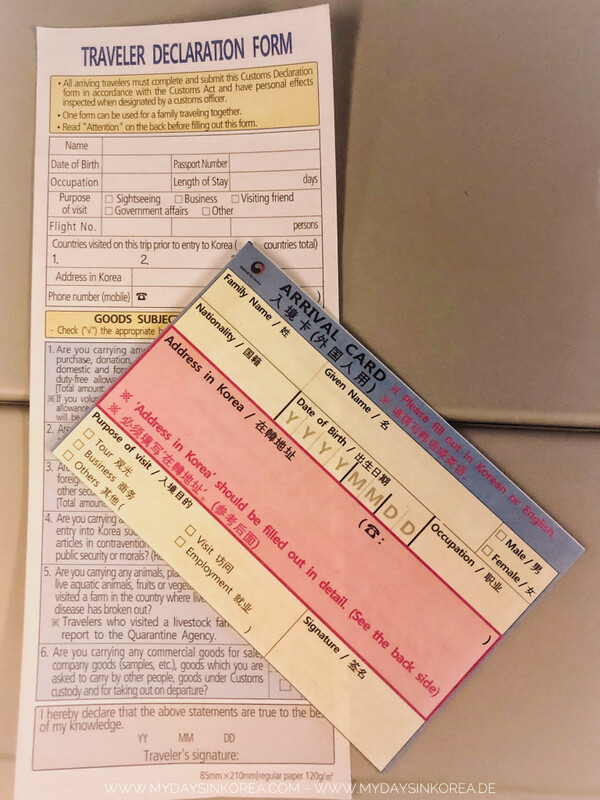 Before landing, you may receive an Arrival card as well as a Traveler declaration form (one per group) from the flight attendants. They both need to be filled out and handed to officers when you pass the immigration.